This program examines South Africa's defining environmental issues. You'll visit one or more of the Eastern Cape's famous game reserves, and coastal areas such as Woody Cape Nature Reserve and Bird Island. Field trips to sites such as George and Knysa (located on the beautiful Garden Route) illustrate South Africa's efforts to reconcile development and conservation. In addition to serving as a port city and center of the South African motor industry, Port Elizabeth has a laid-back attitude that's resulted in the nickname "the Friendly City." A great number of tourists from within South Africa, as well as Europe and the United States, make their way to this beautiful city every year, taking advantage of its beachfront location, sunshine, numerous attractions, and traditional South African food and wine. Explore Port Elizabeth's unique ethnic and cultural diversity, the result of a long history of European settlement and immigration from India, Malaysia, and many other nations. 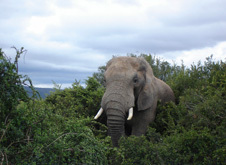 The city is also a gateway into South Africa's unrivaled biodiversity. Port Elizabeth makes an ideal starting point for those who want to explore nearby attractions such as the scenic Garden Route, Tsitsikamma National Park, or one of the many game reserves boasting South Africa's "big five": Elephants, buffaloes, lions, leopards, and rhinos.